The following low resolution photos are available for use in news media publications only. 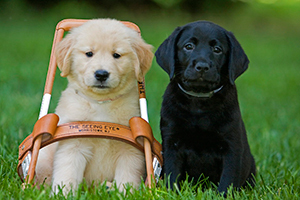 Commercial, promotional and similar uses of the following photographs, and any other photographs on The Seeing Eye web site, are strictly prohibited. Seeing Eye co-founder Morris Frank with Buddy, the first Seeing Eye dog. Frank and his German shepherd are shown crossing a busy street in New York city while onlookers marvel. Seeing Eye founders Morris Frank and Dorothy Harrison Eustis are pictured with Buddy, the first Seeing Eye dog. 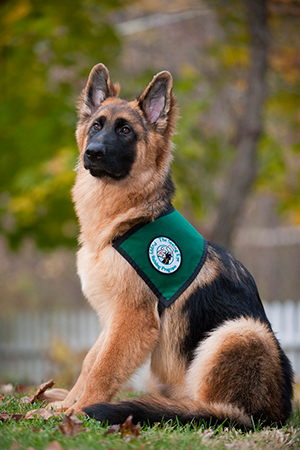 A 6-month-old German shepherd puppy proudly displays his Seeing Eye vest. This is worn by puppies who are at least 6 months of age and have passed a basic obedience and temperament test. 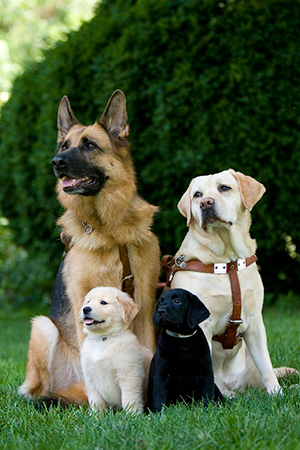 The Seeing Eye breeds, raises and trains German shepherds, Labrador retrievers, golden retrievers and a cross of the Lab and golden retriever. 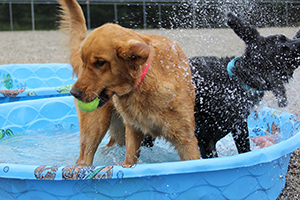 Two moms, a golden retriever and black Labrador retriever, enjoy some playtime during their stay at The Seeing Eye breeding station. 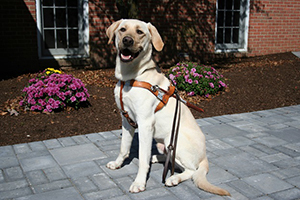 A newly trained yellow Labrador retriever smiles proudly while wearing his Seeing Eye® harness and leash. 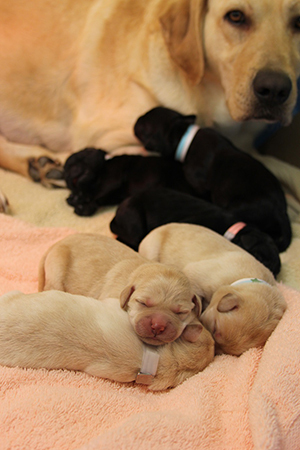 A yellow Labrador retriever rests and watches over her newborn puppies at The Seeing Eye.